Hey everyone, this week we're going to look at five more items from Celestia; the Celestian Crescent Artifact, Lamp, Bookshelf, Tree Sprig and Crystal Street Lamp. The Crescent Artifact is found with Zellozosia the HomeGilder in the Sardonyx, the rest can be found with Gearwise in the Base Camp. BRRRR! The things I do. Not only did I volunteer to get pummelled by a Blizzard but I added lots of creatures that drop it. *Groan* There are comments from the peanut gallery. Fine. Digby, Alric, Dezzy, and Ghost added most of them, but i did do a couple too!! I can absolutely, positively, without a doubt, tell you that your best gardening source for Blizzard Treasure Cards is *drum roll* the Frozen Fly Trap! OK, who guessed that the Frozen Fly Trap is the only source for Blizzards? You'd be right, which would be why it is THE best source. However, it is not a bad source, pretty good actually. We have a special guest here in Dezzy's Closet this week! Our very own Emma Icecrafter is here sporting her Set of the Fireblizzard that she is currently wearing as she quests in Dragonspyre with Ghost. Emma says that she is very happy with her gear, as Dragonspyre marks the beginning of Ice wizards' exceptional Health boosts: nearly an additional 250 health than any other wizards will see with their crafted gear! Emma is preparing for tankdom and we certainly are looking forward to having a tank within our group! 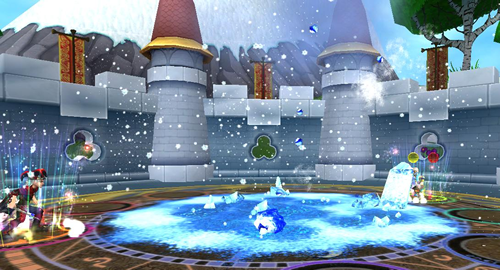 Ice wizards that are level 44 or higher can buy their recipes from Fenrik Doomseeker in the Crystal Grove. You can find him loitering not far from the Teleport Hub. All three recipes will cost a total of 4406 gold.